Knee sleeves offer adequate protection to help prevent knee pains caused by various factors. Just like elbow sleeves, knee sleeves also help alleviate discomfort for injured or weak joints, and promote blood circulation to speed up the healing process. There are many different knee sleeves available today, but the best pair is one that provides enough comfort and support without costing you too much money. This article will serve as your buying guide to help ease your selection process. With so many options to choose from, making a purchasing decision can be tedious. 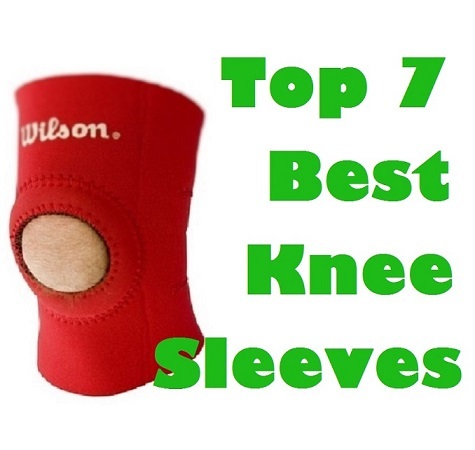 Below are the top 7 best knee sleeves that you can consider. These products are chosen based on their reputability, function, and features. The Rehband knee sleeve is popular among athletes for its durability, performance, and quality. This Swedish knee sleeves is 7 millimeters thick and is IWF and IPF competition approved. It is so popular that you will often see fake Rehband sleeves out there, but do not settle for these cheap duplicates as they will just disappoint you. Sizes available range from 27 to 42 centimeters. It can also be sold as a single sleeve in case you only need support for one knee. The McDavid knee sleeves come with a unique design that made it one of the most popular brands today. Its extended knee sleeve reaches the upper thigh and down the calf. In addition, this product has knee cap protection that people doing contact sports will surely benefit from. Sizes available range between 10 to 22 inches. This product uses moisture-wicking fabric, so your legs can breathe. It is made of 80 percent nylon, and 20 percent spandex. 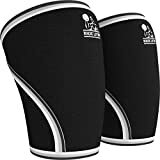 With ample compression, this pair of knee sleeves will work great for contact athletes who want protection and performance for a reasonable price. The Nordic Lifting knee sleeves set is perfect for powerlifters, weightlifters, and crossfitters. For a reasonable price, this product offers excellent compression for injury prevention, maximum performance, and rehabilitation (for injured athletes). It is designed to fit both male and female users, with sizes ranging from 11.8 to 18.3 inches. The Nordic Lifting knee sleeves set is made of 7-millimeter neoprene for optimum compression. The Bracoo neoprene open knee sleeves help relieve knee pressure and reduce knee joint fatigue. Popular among athletes, this product is well-known for its reinforced patella stabilizer feature that will help support the ACL, MCL, PCL, and LCL. It is designed to provide ample support for arthritis, post-surgery knee pain, and other joint problems. The sizes available range from 12.5 to 18 inches. The open knee design allows for additional support, especially the ligaments. Best of all, the Bracoo knee sleeves can be worn every day. The Rehband Core Line knee sleeve is designed for various purposes. They can be worn for athletics, rehabilitation, and compression. The fabric used is a bit thin at 5 millimeters, but can still offer a comfortable fit with adequate compression. You can wear them during your physical activity or whenever you feel like moving around without feeling restrained. The sleeves embrace the contours of your knee. They can be worn by men and women. This support sleeve provides superior knee stabilization, and keeps the area warm. Made of elastoprene, this sleeve is guaranteed breathable and durable at the same time. Since it has heat retention capabilities, it helps reduce the swelling and promote healing. It keeps the moisture out to prevent sweating. The reinforced edges offer additional comfort as the sleeve is prevented from slipping or rolling. The sizes available are small/medium, and large/extra-large. This is a great pull-up sleeve that gives moderate knee support, while promoting healing and preventing excessive sweating. Mueller has been a popular brand for many years because of its high-quality sports medicine products. Its pull-up sleeves provide firm support for weak, stiff, or even sore knees without restraining movement. It features a contoured design that helps prevent slippage and bunching, and ensures proper fit. The material used offers adequate compression without causing excessive sweating. The warmth is retained to promote healing and alleviate pain. This basic knee sleeve provides protection and support, but may not be appropriate for people with serious injuries. If you plan to use it for minor knee pains or injury prevention, then it is definitely a must-have. Knee sleeves provide support and comfort to help alleviate any pain felt on the area. One of the models discussed above could be your best option. Most people use the knee sleeves for their joint problems, but they can also help prevent injuries. It is important to find the right size to ensure a comfortable and correct fit, as well as the right level of support. A top brand among sports gear is Rehband and their Rehband 7751 Knee Sleeve is popular among CrossFitters for its first-rate quality. This sleeve includes a 5mm band made of neoprene. It’s thinner and more lightweight, and it also feels more comfortable than its peers. While still providing trustworthy support and allowing you more freedom of movement, it’s incredibly sturdy and long-lasting. Another favorite among CrossFitters is the Kunto Knee Sleeve. This exceptional product is highly durable and can be used safely for middle to heavy duty work. Its best feature is that the area covering the quad muscles is contoured to fit snugly and comfortably though it doesn’t have a neoprene band. It also provides excellent compression with the material being stretchable and at the same time lightweight. Recommended for its value and quality is the Nordic Lifting Knee Sleeves. It’s equipped with a neoprene band that’s 7mm thick and it securely covers your knees. The durability is decent though not at par with other higher end knee sleeves. It’s also easy to clean unlike most knee sleeves. Compression is pretty good as well. Knee sleeves are a must-have for anyone who wishes full support for his knees and joints. This is especially important when you suffer from pain, when you’re recovering from an injury and if you want to protect your knees and keep them from becoming stiff and sore. Depending on design, you can choose from three types of knee sleeves. Several knee sleeves have side stabilizers inbuilt into the design to give extra support. Other knee sleeves have a more open design with an opening at the front to avoid putting pressure on the knee cap while providing more airflow to the knee. 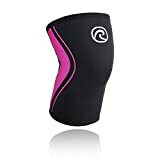 As for the closed knee types, you’ll need this if you’re looking for something that keeps in warmth and provides full support to the whole knee area. You will also need to consider what you’ll be using the knee sleeve for. Is it simply for working out? Are you recovering from an injury? Do you need more protection for your knee because you’re an athlete? There are different brands and models recommended based on your intended use. Different knee sleeves are made of various materials. Those made with cloth give the least amount of compression and heat but is a better choice for those using it for daily purposes only. They are softer and more comfortable. If you’re nursing an old injury or need to protect your knee, choose knee sleeves made of neoprene. They have better compression, fit more tightly and retain heat well. Knee wraps that go around the whole knee are best for improving your exercise and athletic performance. It’s important to choose a knee sleeve that fits firmly in order to maximize its heat and compression benefits. Be sure to measure your knee and leg and choose the knee sleeve that fits you best. For athletic performance, you may opt for a knee sleeve with a tighter fit. Try on the knee sleeve as well to ensure that you have the ideal fit before purchasing it. One of the best ways to protect your knees from injury is to wear a knee compression sleeve which provides extra support for your knees and will also keep them from swelling. The Ultra Flex Athletics Knee Compression Sleeve gives excellent support. It’s incredibly versatile and will suit any activity, whether it’s weight training, sports or martial arts. The soft material is superior in comfort and highly stretchable. It also doesn’t slip easily, plus it’s lightweight. It will shield your knees from future injuries and aid in recuperating from existing pains. A top of the line compression knee sleeve, the Tommie Copper Recovery Knee Compression Sleeve is among the best for recovery. It provides warmth and compression to facilitate quicker recovery and ensure protection. Another thing that sets it apart from its rivals is that it’s infused with copper. The soft and ultra-comfortable material, despite being thin and lightweight, is quite sturdy and does not easily slip. A hit among the pros as it guards against injuries and helps improve performance is the McDavid 6446 Hex Padded Compression Leg Sleeve. This is because of the top quality cushioning on the kneecap and the fact that it covers a large portion of the knee area. It also features comfortable but breathable material that prevents excessive sweating. The Nordic Lifting Knee Sleeve is composed completely of neoprene to make it more supple. Its sturdiness is assured with its 7 mm thick material and double layer of stitches on the seams. This knee sleeve also gives both warmth and compression. It conveniently stays in place and doesn’t easily slip while providing a comfortable but tight fit that helps to boost your performance. Also built entirely of neoprene, the Primal Elite Knee Sleeve is shaped to embrace the knee and leg for maximum support and reliable compression. The excellent fit ensures that the sleeve doesn’t easily slip and in addition to that, the extra layer of stitching increases the strength and durability of the sleeve. Its enhanced elasticity also improves your lifting performance. Developed by top powerlifting expert Mark Bell, the Slingshot Strong Knee Sleeve provides a fit that’s among the best for comfort and compression. The protection and insulation it offers are top of the line, but one of its best features is that it even has an inner lining which some knee sleeves lack. This detail is what makes this knee sleeve most comfortable even for long periods. One of the most popular brands for knee sleeves, the Rehband 7mm Knee Sleeve is accepted for competitions. They offer the best compression, incredible support and maximum protection, plus the elasticity of the knee sleeves are excellent and contribute to increased athletic performance. Made of the finest neoprene foam material, they’re also great to use to hasten the recovery of your knees from injury. For tightness and compression, the Evolutionize Knee Sleeves are well worth considering. Their neoprene material is 7mm thick, the best thickness for quality knee sleeves. The material is heavy duty and slip-free, as well as resistant to tears while providing the ultimate support. Durability of this knee sleeve is also astounding with a triple layer of stitching compared to the sturdy enough double stitching of other products. The comfortable feel of the material is one of the Mava Knee Sleeves’ greatest features. It’s built of neoprene, with a terrific fit and support that’s just right while still giving adequate freedom of movement. The reinforced double stitching makes this sleeve strong and durable. Additionally, the knee sleeve does not easily slip and still feels comfortable around the knees. We help you to discover the beauty of healthy living with natural remedies, health hacks, diet tricks, beauty DIY and happiness tips.